Jurgens is a writer that tends to understand the kind of characters that he is writing. Whether it’s Booster Gold or Superman, he fundamentally understands the voices and actions of these characters. And with the Joker and Batman (Terry), he continues to prove that he always makes it a priority to understand the motives and voices of these characters. The Joker is as crazy as he’s ever been and is willing to paint the streets of Neo Gotham with blood dripping nostalgia in order to prove it. What I enjoy most about this issue is how Jurgens is able to display Grayson and Bruce’s mutual respect for each other despite their disagreements on how things are in regards to the methods of Batman. 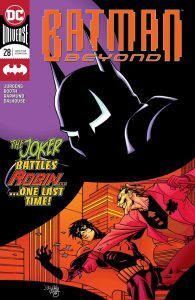 Jurgens manages to display the relationships of each of the characters, between Grayson (OG Robin) and Bruce (OG Batman), Grayson and his daughter Elianna, and Terry (Batman) and Matt (Robin), showing the various similarities and parallels as the battle between the Joker and Batman ensue throughout the issue. From beginning to end Jurgens makes the effort to keep you engaged in the story and the scuffle of characters old and new. It’s what I’ve always enjoyed about Jurgens as a writer, he focuses on the story and characters, making it feel like you aren’t missing out on neither so that by the time you finish the issue, you feel satisfied to see all that you needed to see out of the story. 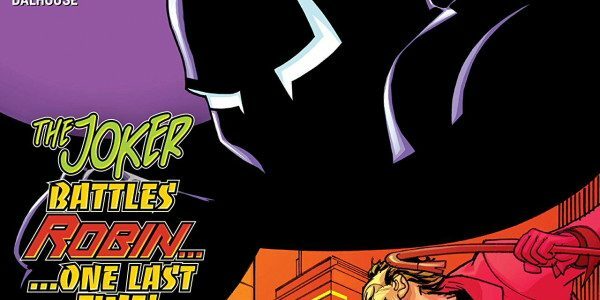 The structure of the story and plot itself felt tight and focused, leaving the reader to enjoy the entirety of the issue all the way through until the next issue! The art by Brett Booth never fails to capture the synergy that is created between Batman Beyond, the Joker and rest of Neo Gotham. We get some really beautiful, action-packed, pages full of cinematic excitement. The double splash page perfectly sets up how energetic and destructive the showdown between Terry and the Joker become as the sins of the last generation creep into the current of Neo Gotham. Rapmund’s inks are sharp and give a crispness to Booth’s pencils. Dalhouse’s colors delivers a beautiful layer to this beautiful cake of a book. And Lanham’s lettering is the perfect cherry on top of this cake of a book, delivering perfect placement for the dialogue in contrasts to the artwork in this issue. Lanham’s letting gives this issue all of the space for the art to breathe while also giving spaces for the voices of the characters to shine through. Personally, this is a favorite issue of mine and one of my favorite series and Jurgens is continuing to churn out excellent work! This is a solid Bat title and a solid series that I feel isn’t really talked about enough due to all the other stuff that’s released. This is much worth your time if you’re looking for a Bat-book that always keeps things interesting and isn’t tied down by the status quo of the usual DC continuity. I definitely recommend adding this to your pull list for new comic book day!